The Veteran Civil Guard of Manila was formed in 1871-72 as an urban paramilitary police force to assist the regular Guardia Civil in subduing insurgent and criminal activates in the region of Manila. The force was made up of loyal native Filipinos that had served in the Spanish Army, naturally under the command of Spanish officers. Always a small force, the Guardia Civil Veterana began with a Captain, 6 Lieutenants, 6 Alféreces, 12 Sergeants, 12 Corporals, 72 1st Class Guardsmen and 250 2nd Class Guardsmen. By July 1, 1898 the force consisted of a Commander, 14 officers and 325 men. 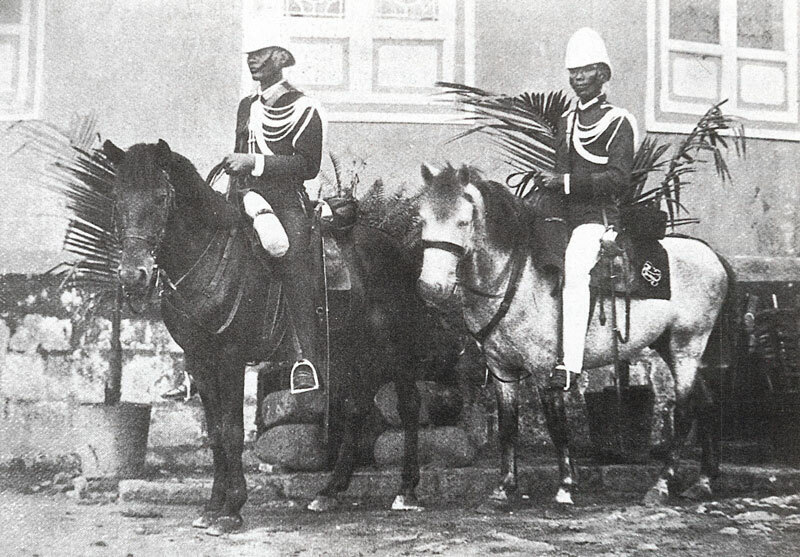 Their uniform was first described in the 1871 regulations for forces in the Philippines and was updated in 1887and in 1892. 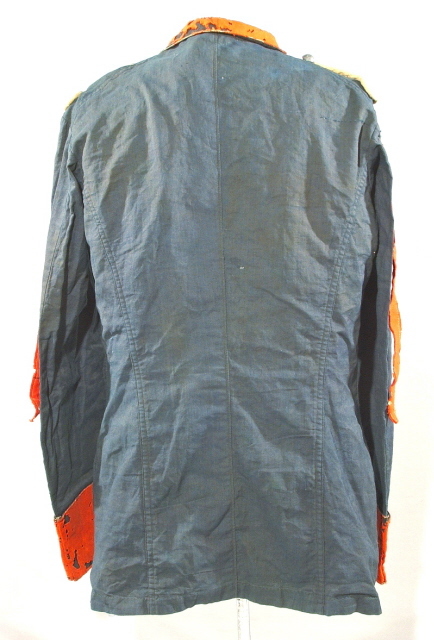 It was similar to that of the Civil Guard, blue cotton with red wool collar and cuffs. 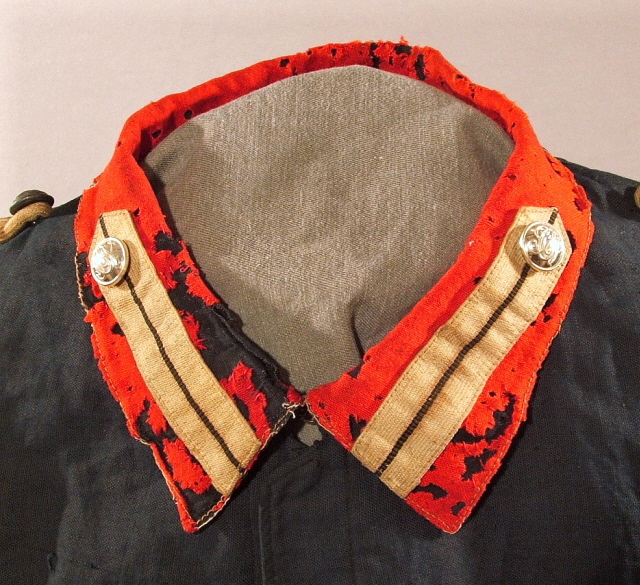 White with black center stripe collar tabs (sardinetas) with a button at the end point were worn by all the Veteranas, and is the most distinct difference between their tunics and that of the regular Civil Guard. 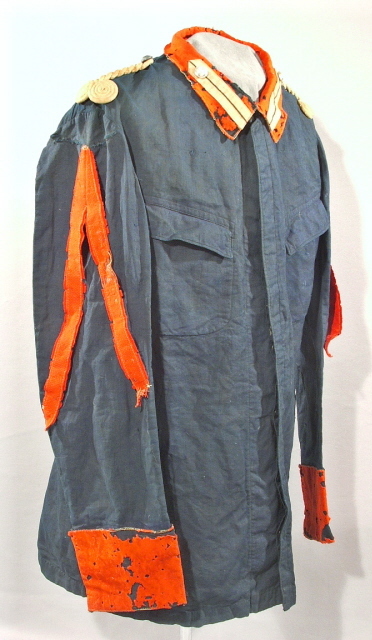 The white twisted shoulder cords with double flat knots were the same as on the Civil Guard uniform. The buttons were silver plated and embossed with the cypher "GCV". Buttons with both a crown over the cypher and without it are known to have been used. 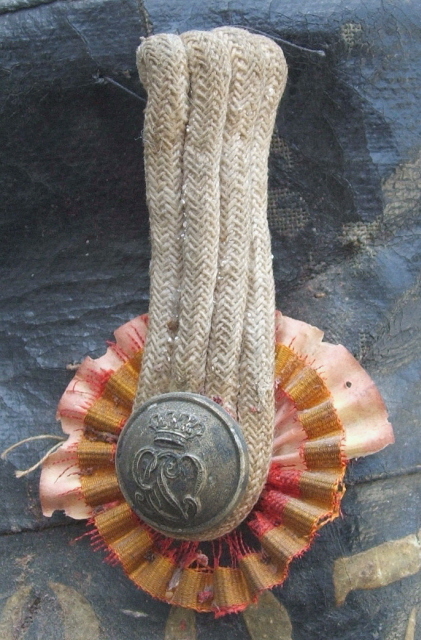 A white cord aiguillette was worn on all occasions. 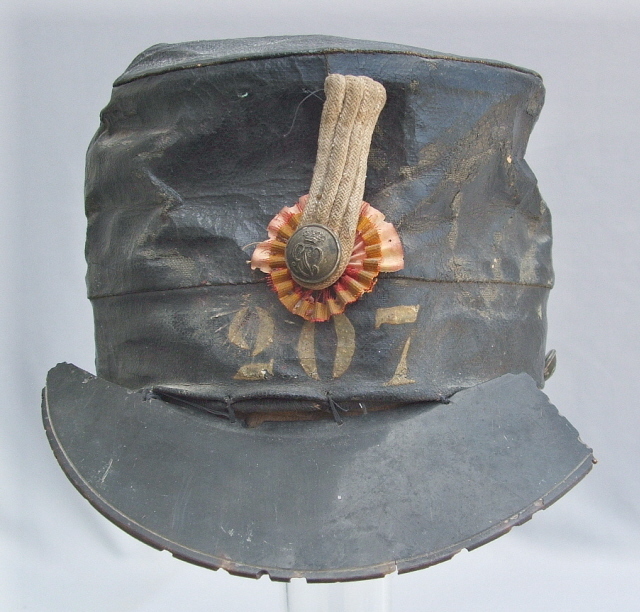 The 1887 regulations proscribed a kepi (Teresiana) in place of the pith helmet worn by the Civil Guard, but photographs show its continued use, as well as the straw hat for field service. In the Regulations of 1892 the pith helmet is back for daytime service wear but the Teresiana is to be worn in the evening after 6 pm. Service dress trousers were of matching blue cotton with wide red wool side strips. For Gala dress white trousers were prescribed. 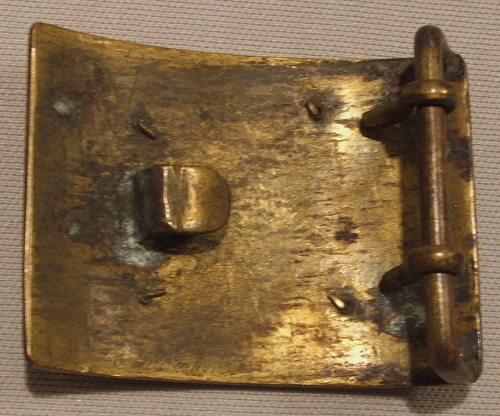 The leather belt and machete frog were black, not the yellow color of the Civil Guard, and the regulations call for a belt buckle was a silver plated brass rectangular plate and pierced with the Guardsman's individual number like those worn by the Orden Publico in Cuba and Puerto Rico. 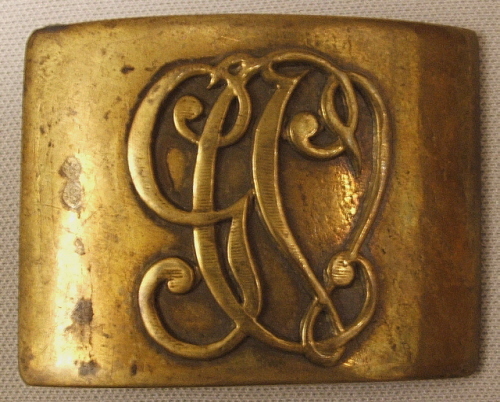 A brass buckle also exists with an applied intertwined "GCV" cypher. 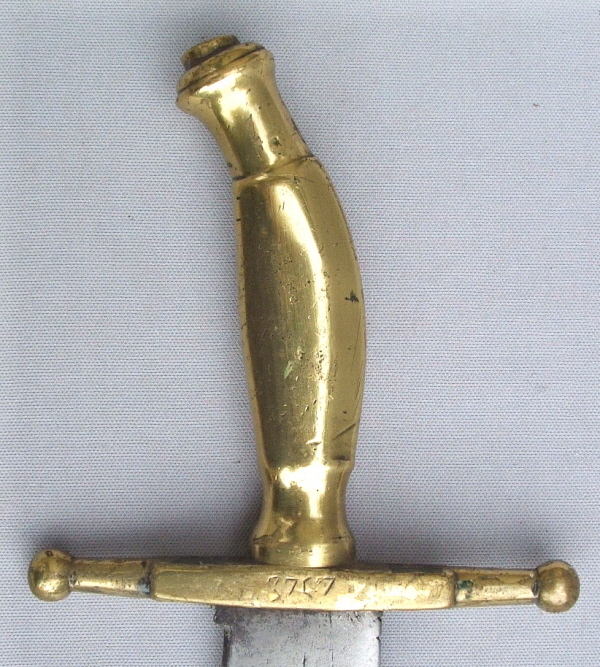 A brass handled machete of the Model 1843 type was carried as a side arm. The exact designation used by the Spanish for this machete is currently not known to me, but one source refers to it as a "machete tagalo". Foot troops were armed with Remington rolling block rifles and socket bayonet. 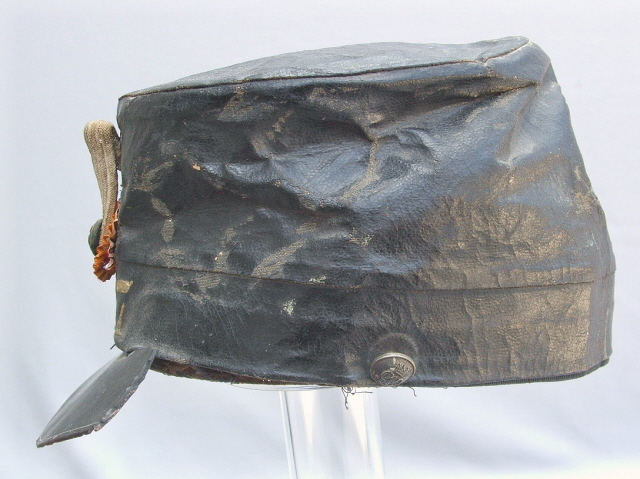 Leather equipment was of the 1886 Infantry pattern. A small mounted contingent of the Guardia Civil Veterana also existed. Their uniform was identical to that worn by the foot troops with the exception that they were armed with a saber. Equipment included a Cavalry style cartridge pouch on a shoulder sling, all in black leather, in place of the Infantry accoutrements. Their saddle blanket was dark blue trimmed in red with white intertwined cypher "GCV" in the corners. 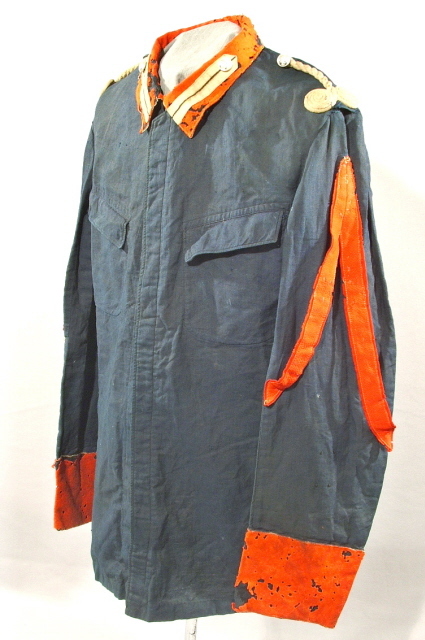 Tunic matching the 1887 regulations for a 1st Class Guardsman of the Guardia Civil Veterana de Manila. 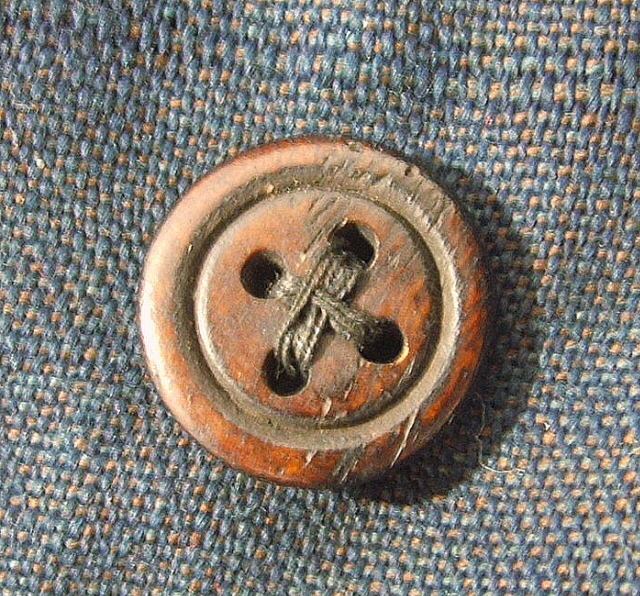 Button types found on this garment. 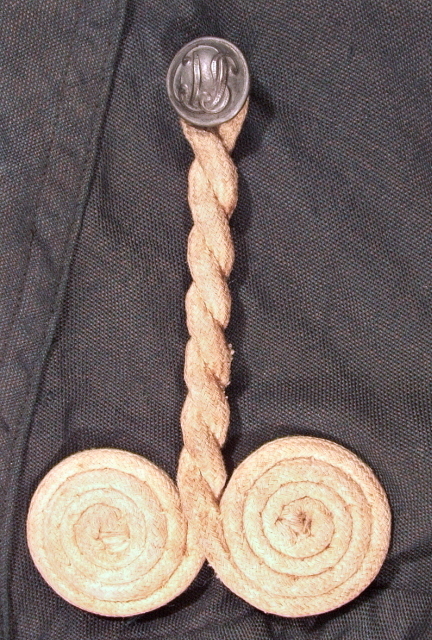 The duller button on the left is original to the tunic and was made in Manila. 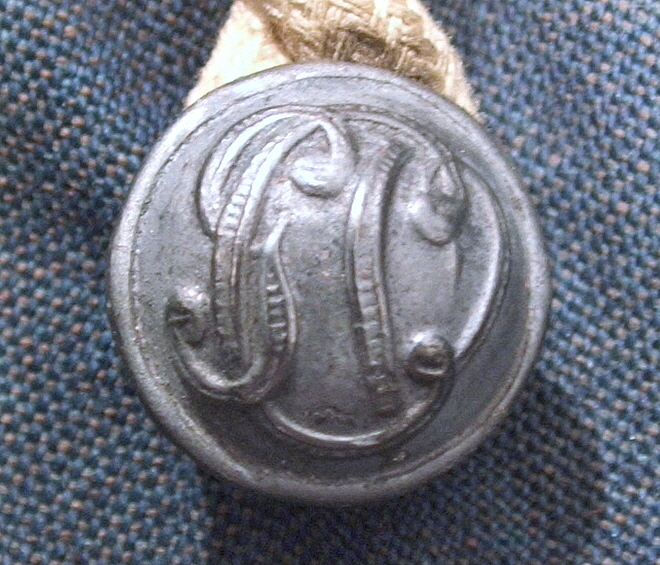 The center button is one of three original period buttons made by the French contractor "T.W.W. 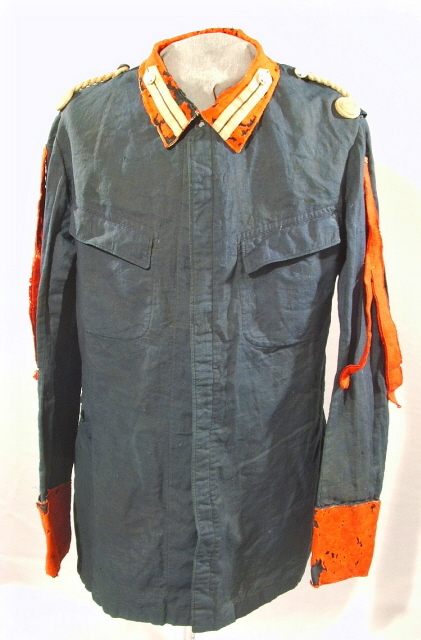 / H.M" used to restore the buttons missing when the uniform was acquired. 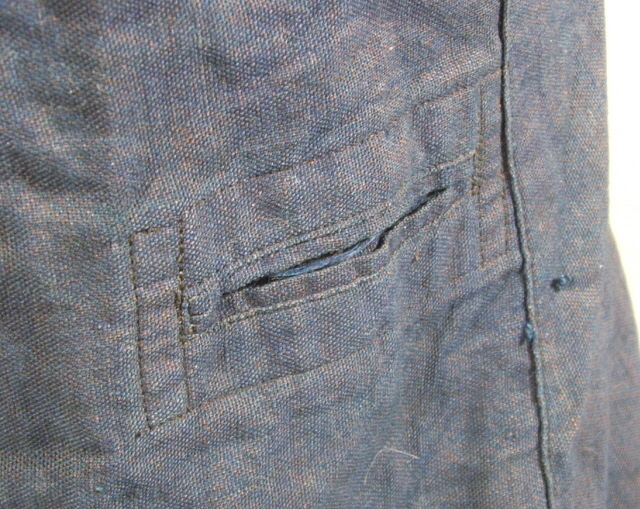 The bone button on the right is one of the original closure buttons concealed under the fly front. Waist slits on both sides allow the revolver holster and machete frog to be worn without showing the belt, a common Spanish practice during this period. 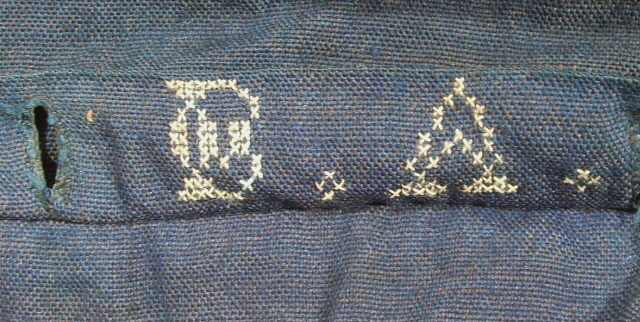 The owner's initials cross stitched under the front fly. 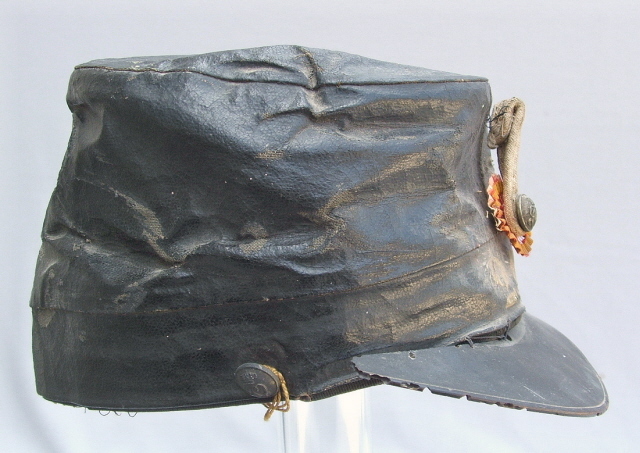 1887 regulation GCV kepi or Teresiana of black oilcloth with tortoise shell visor. 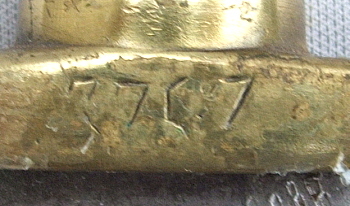 The white painted number "207" is the Guardsman's individual number and would also have been on his belt buckle. 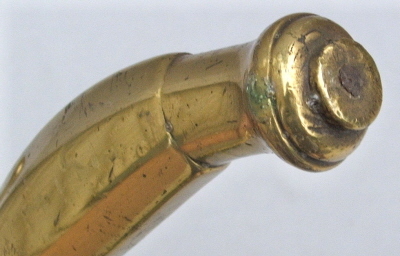 The cap is shown as found and before any stabilization has been attempted. Cockade, note the 'crowned' variation of the "GCV" cypher button. This example was made in Barcelona. 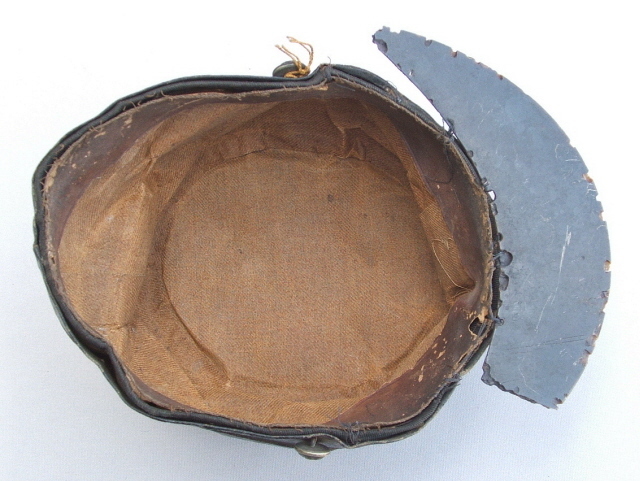 Interior view showing the stiffened canvas base and the leather sweatband. Note the damage to the tortoise shell visor. 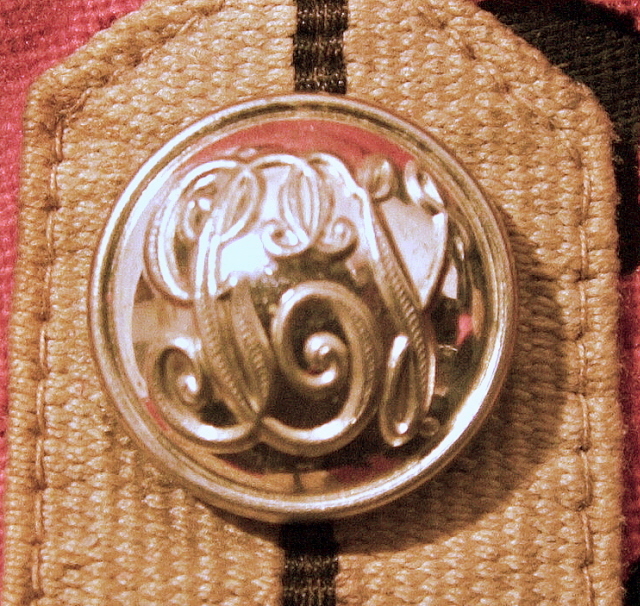 Although the regulations called for the belt buckle to be a silver plated brass rectangular plate pierced with the Guardsman's individual number, a second pattern was used. This has the "GCV" cypher applied to a cast brass plate. This variant is probably of local manufacture in the Philippines. 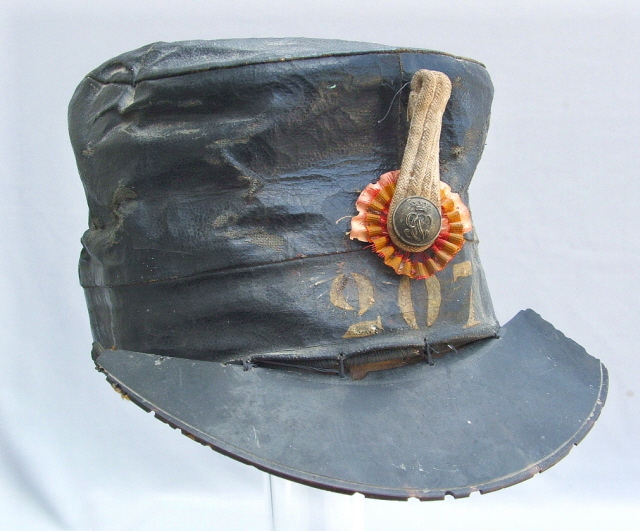 This example was found among the souvenirs of Lt. J. J. Walsh, Co. K, 13th Minnesota Volunteer Infantry. 20.5 inch total length with bowie clip point blade and brass hilt. Photos have recently come to light that show this pattern machete in use with Spanish Guardia Civil, Guardia Civil Veterana and Carabineros personnel in the Philippines. Its use may have also extended to other units. All material is Copyright 2008 by William K. Combs. No portion may be used without permission.